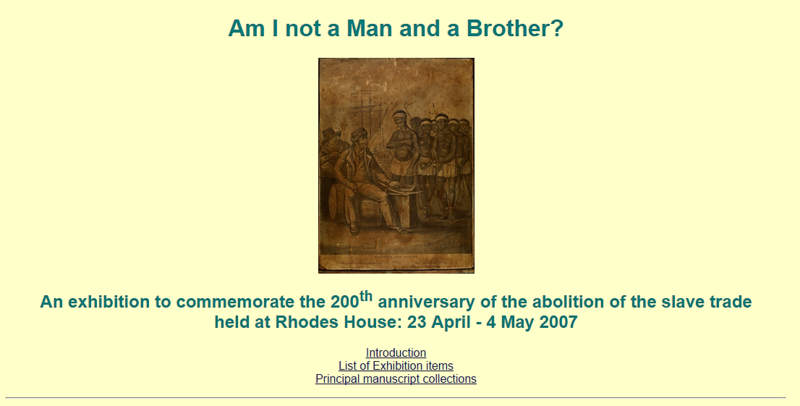 ‘Am I Not a Man and a Brother?’, an online exhibition to mark the bicentenary, was launched by the Bodleian Library of African and Commonwealth Studies at Rhodes House. Some of the items were also on view in an exhibition at Rhodes House in April and May 2007. The exhibition included manuscripts and books from the Library, among them the manuscript journal of Rev. James Ramsay, who wrote and worked against slavery after seeing for himself the conditions on board a slave ship while a Royal Navy surgeon. Also exhibited were related artefacts from the collection of Franklin Smith, including a tobacco jar and a clay pipe bowl, both in the shape of the head of a slave (indicating that their owners may have been slave owners), and the late 18th-century engraving of a slave market in the West Indies, published by an anti-slave trade body.